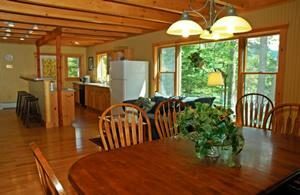 Whether you come up to hunt, train dogs, fish, or simply stay to explore the area you will enjoy our well-appointed Point House Lodge on the shore of Wyman Lake. We offer free wireless, incredible meals and great company with people that share your passion. We feel that combining some of the best wild bird hunting and training grounds in the east with the finest accommodations in the area, makes a great deal of sense. Add to that, a creative personalized menu and the gorgeous setting to enjoy it in, you’ll be presented with all the components of a memorable trip in some of the most beautiful unspoiled country you’ve ever seen.